and Alissa Bourne (below and righ)t with Kaustin. 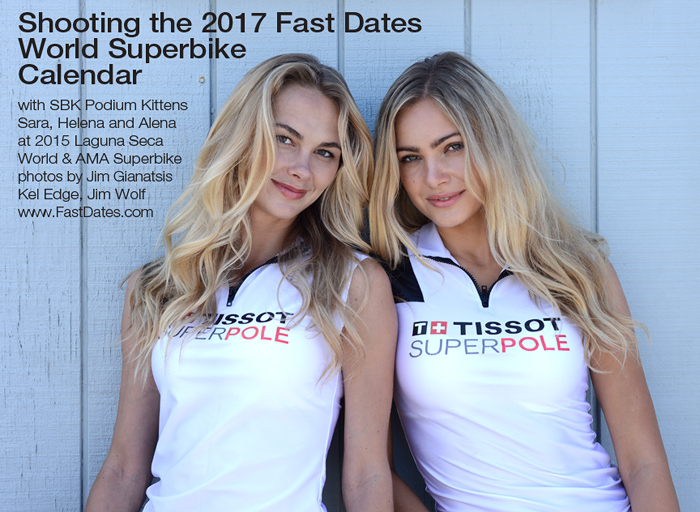 our ongoing association with SBK World Superbike and the UmbrellaGirlsUSA.com to bring 2 more beautiful FastDates.com Calendar Kittens; Kaustin Lanae and Alissa Bourne to shoot with me at the 2016 Mazda Raceway Laguna Seca United States SBK World Superbike and AMA National race weekend July 8-10th. There they served as the official SBK Podium Girls and helped me shoot the next Fast Dates World & AMA Superbike Calendar. Then, two weekends later the Kittens would also be with us at the 26th annual LA Calendar Motorcycle Show and Calendar shoot in Los Angeles on July 23-24th. Kaustin lanae (let) and Alissa Bourne (right). A University of Maryland graduate and 4 year member of the University's Women's Soccer Team, Alissa Bourne earned a CPA Degree in Accounting, and had planned to join her father's accounting firm after college. But the pretty Blond got the urge to see the world first and try her hand at professional modeling. So after college she moved to New York where she has been working successfully as a professional fashion and commercial model the last 4 years. We discovered her on Facebook.com, and invited her to come out a spend the month of July with us in Los Anegles, and to work with us at World Superbike and the LA Calendar Motorcycle Show. Our second new Calendar Kitten was Kaustin Lanae, 19 years old from Phoenix, Arizona.We call her "Kaussie" who at age 18 moved to Los Angeleto begin modeling. Kaussie also joined us at the 2016 LA Calendar Bike Show Weekend, then on the Edelweiss Paris to Omaha Motorcycle Trip together across France in August 2016. 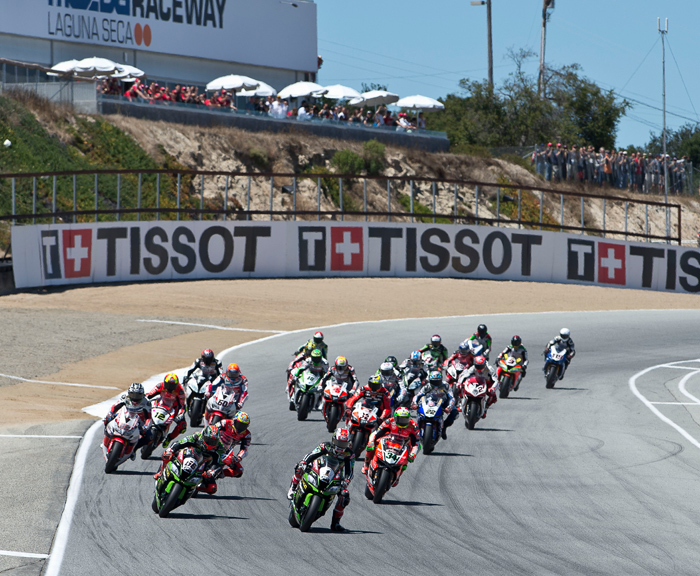 Our drive up to Monterey and the World Superbike Weekend started at my house in Los Angeles were we meet at 10am Thursday morning, loaded up the car and began the drive up Highway 101 and California's beautiful a Pacific Coast Highway 1 to Carmel and Monterey. 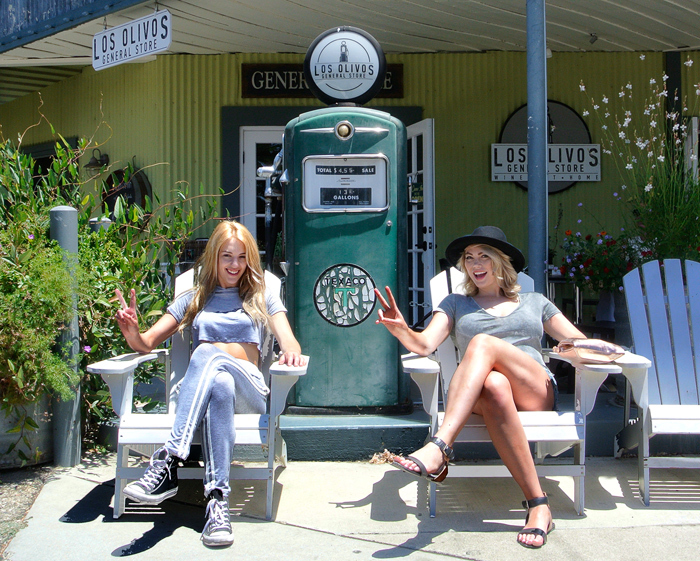 Our first stop of the day is always in the beautiful farm village of Los Olivos on the Highway 154 bypass across the Santa Barbara peninsula. Our transportation was my beautiful new 530hp 2015 BMW M4, which had just replace my just as beautiful old 2002 BMW M3 which had made the same trip the last 13 years. Two hours north of Los Angeles we made made our first stop of the day at the quaint little fare and wine making town of Los Olivos We walked around the town and visited the shops, art galleries and an old church, sampled wine, and had a wonder lunch on the front porch of my favorite restaurant there. Here the Kittens check out the Los Olivos General Store, and J West Outdoor Garden Shop in Los Olivos which has an incredible display of hand made home and garden decorations. Kaustin and Alissa pose for a picture on our BMW M4 in Los Olivos. The car has been upgraded with a Turner Motorsports 530hp engine remapping, Brembo carbon Ceramic Brakes, 275 Front / 295 Rear Michelin Pilot Cup Tires, Dual Clutch 7-Sppen Transmission and Active Suspension. Fast and it handles and stops! On Thursday we make the run up to World Superbike on Pacific Coast highway, taking our time with lunch and photo stops along the way. Coming home Sunday evening after the races on 4-lane Hwy 101 we can make the 300 mile run in under 4 hours cruising at 100 mph between bunched traffic and CHP alerts on our Passport Radar Detector. Wind blown Calendar Kittens Alissa and Kaustin on Pacific Coast Highway 1 on the way from Los Angeles to Monterey, California. Saturday evening in Monterey on Cannery Row is the big Race Weekend Bike Night with the street closed down. We got into down around 4pm after working at the track, and got to spend a couple of hours visiting the extraordinary Monterey Aquarium which is right there at the end of Cannery Row. Kaustin plays bad girl as she flips us the "The Bird" while posing next to a Monterey Police RV. Kaustin and Alissa hard at work on Friday evening on Pit lane shooting with Alex Lowe's factory Pata Yamaha R1. 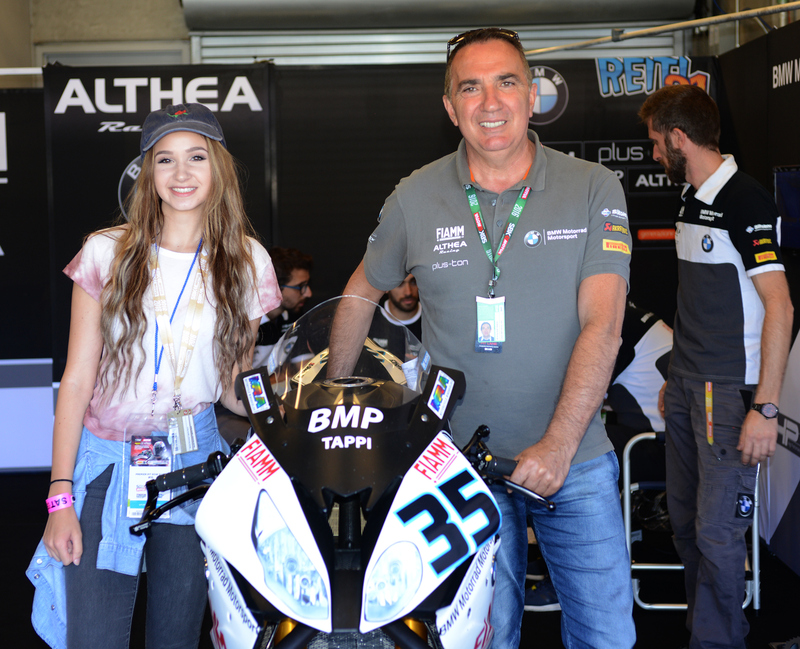 Althea race team owner Genesio Bevilacqua needed attractive umbrella girls for his factory BMW team riders, but without any budget, so we found them adorable 18-year Alex Korteoff who was taking in her first ever motorcycle race at laguna Seca World Superbike with her dad. We twisted her arm an got her on the Starting Grid for both day's SBK races with likable team rider Jordi Torres. 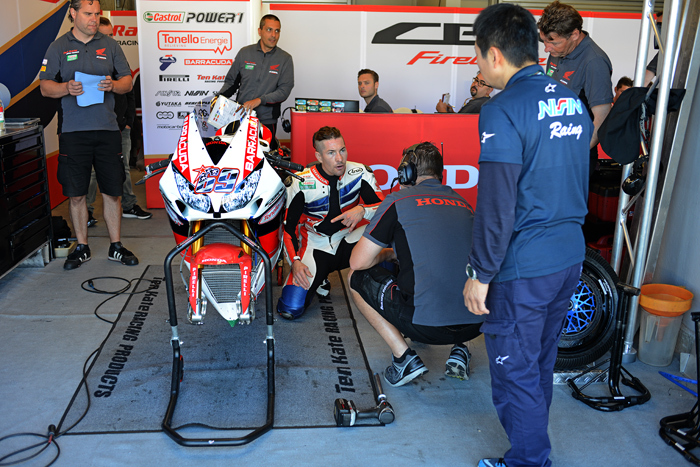 The winningest team combo in SBK World Superbike, 2015 SBK World Champion and 2016 Points Leader Jonathan Rea with his crew chief Pero Riba. And you know who Kaustin Lanae and the Championship dominating Kawasaki ZX10R are, most certainly! The nine SBK umbrella girls ready to go to work on Saturday at Laguna Seca as part of the new 2-day race format. Kaustin was one of two Tissot Superpole Girls, and Alissa was Miss Prosecco Doc Champagne (the Gold Dress) and awarded the Prosecco on the podium to the race winners both days. 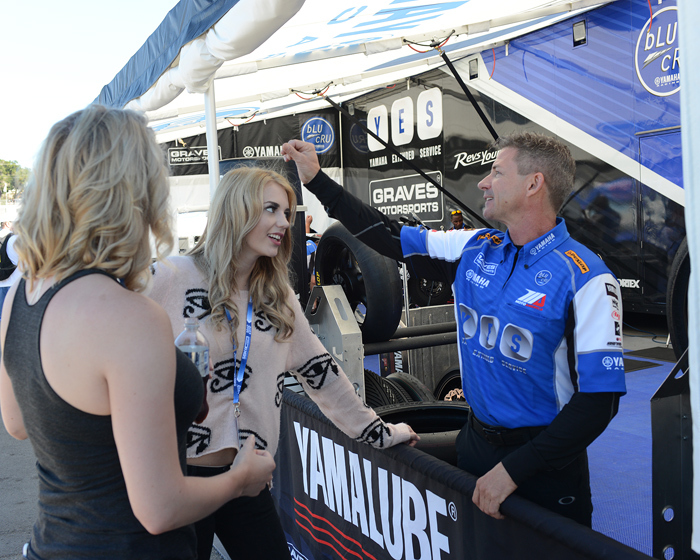 Our buddy, Yamaha AMA Superbike team owner Chuck Graves does some fine tuning on Kaustin's wind blown hair. Alissa checks out the factory Yoshiura AMA Superbikes of Roger Hayden and Tony Elias on Pit Lane. MV Agusta factory rider Leon Camier always likes to come out for our shoot with his bikes and interact and pose with the models. 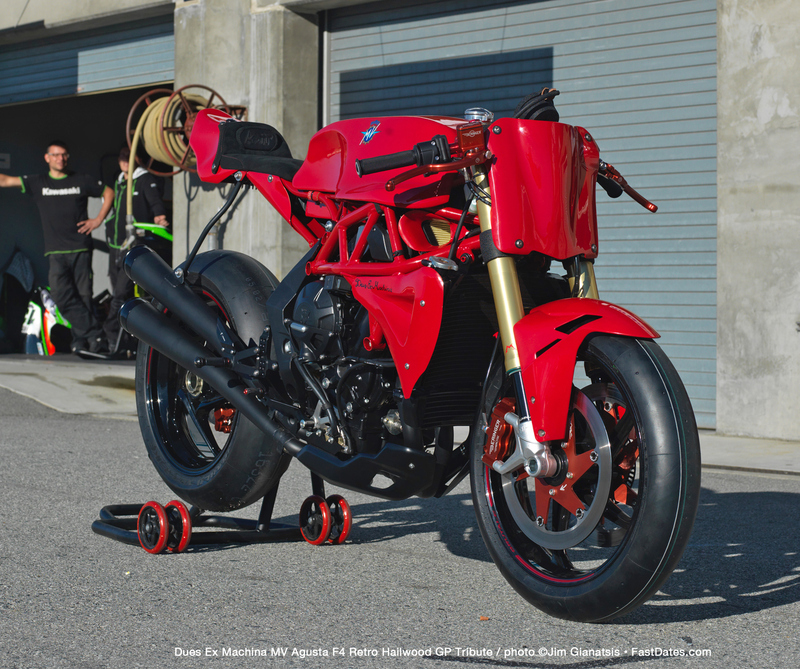 This year he poses with his MV Agusta Reparto Corse 1000 F4 World Supebike , and a Mike Hailwwod inspired retro custom cafe racer (also shown below) based on a new 1000 F4 built at Dues Ex Machina in Los Angeles. This Mike Hailwwod MV Agusta '60s racer inspired retro custom cafe racer was built using a new MV 1000 F4 for a customer by the custom bike shop Dues Ex Machina in Los Angeles. It looks good enough to be a real production bike like the MH1000 Hailwood Replica Bike that Duati brought out abou 12 years ago. Hopefully it will inspire MV Agusta to do the same. How adorable are Helene and Sara in their Tissot Watch Superpole uniforms !Here they are waiting for the top 3 riders to pull in for the Superpole awards on Saturday afternoon. 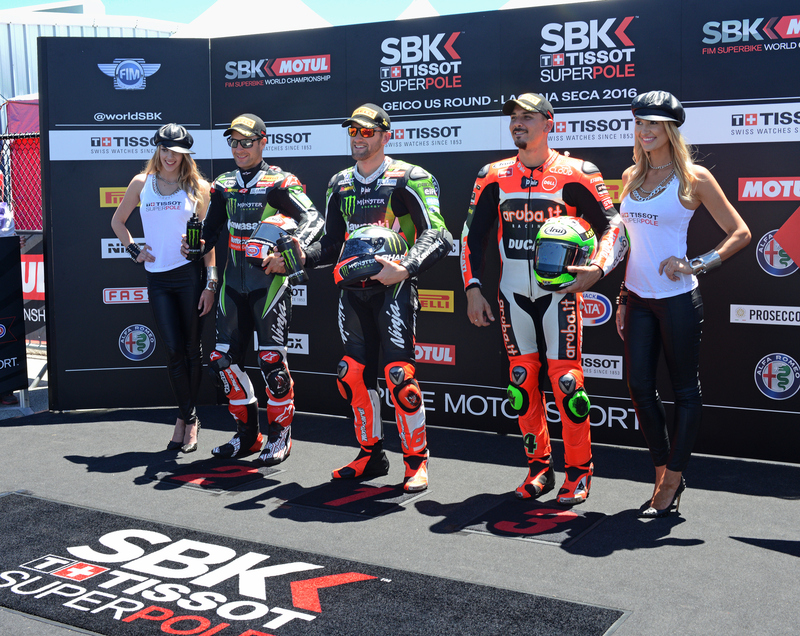 Kaustin (far left) served as one the two Miss Tissot Watch girls during the race weekend, and here helps awards the Superpole fastest Pole Qualifier award to Kawasaki's Jonathan Rea, who was joined on the Front Row by teammate Tom Sykes and Ducati's Davide Giugliano. 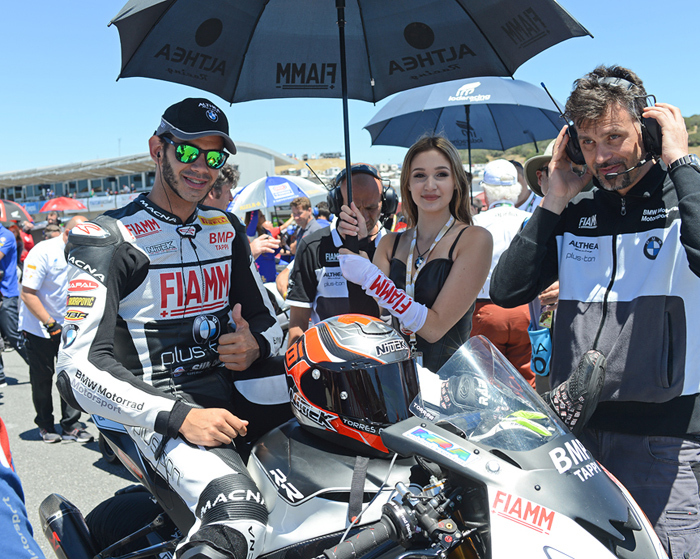 Alex Korteoff who was taking in her first ever motorcycle race at laguna Seca World Superbike,on the Starting Grids her first ever umbrella girl for both day's SBK races with likable team rider Jordi Torres. Alissa hosted the Pit Show on Saturday as Miss Prosecco Doc Champagne, with Team Kawasaki's Jonathan rae and Tom Sykes, and Ten Kate Honda's Nicky Hayden and Michael Van der Mark. 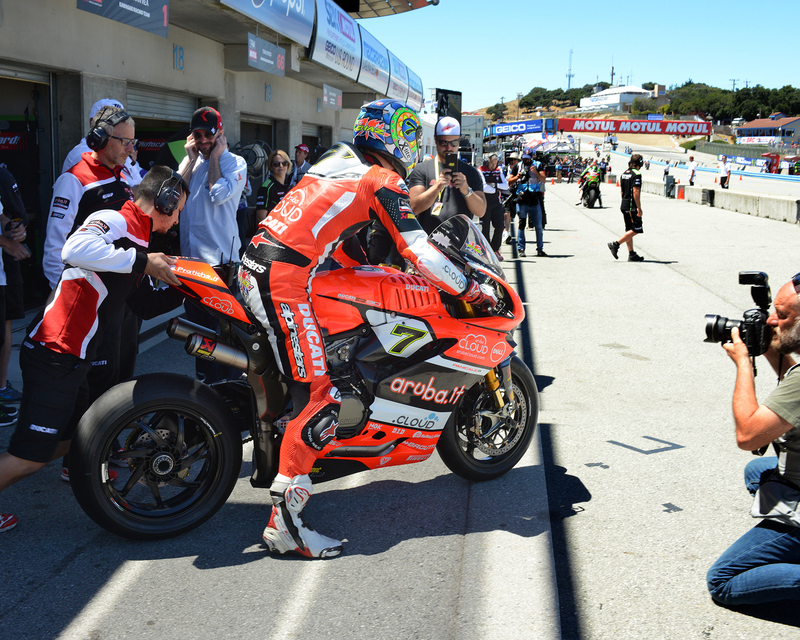 Kaustin and Alissa were among the nine SBK umbrella girls working at Laguna Seca. Kaustin was one of two Tissot Superpole Girls, and Alissa was Miss Prosecco Doc Champagne (the Gold Dress) and awarded the Prosecco on the podium to the race winners both days. American Nicky Hayden made his return to SBK World Superbike this year on the factory Ten Kate Honda. One of our past Official SBK Fast Dates World Superbike Kittens Jessica Harbour, worked at Laguna Seca this year as Nicky Hayden's Ten Kate Honda umbrella girl for the race weekend. Jessica has regularly been featured in all the FastDates.com Calendars since 2014 and will be featured again in the 2018 Calendars. Pole sitter Jonathan Rea (1) and Kawasaki Team mate Tom Sykes (66) lead the race start over the rise at Turn One and start braking down into Turn Two. Kaustin loves motorsports, riding motorcyes and driving fast cars. Being booked to work Laguan Seca World Superbike, the LA Calendar Show and do our Calendar shoots was a dream come true for her. MotoAmerica had an awesome display of former factory Superbikes from the 1980s and 1990s including Fred Merkel's 1984 AMA Superbike Championship winning Honda VFR75o Intercepter. Shooting the Kittens on Cannery Row (above) and Kaustin on Pit Lane with one of the Monster Kawasaki girls. with SBK Podium Girls Sara, Alena ans Alena. Click on the cover to order. Click above to see the 2017 Fast Dates Calendar shoot with Sara and the two Alenas. Click above to Order the 2017 Fast Dates Calendar shoot last year at Laguna Seca SBK and AMA with Sara and the two Alenas. Order the Fast Dates.com Calendars!